The Emerson-White Hours (MS Typ 443–443.1, Houghton Library, Harvard University) is a book of hours and missal produced in Valenciennes, Bruges, and Ghent in the late 1470s or early 1480s. There are seven full-page miniatures (many more have been removed), fourteen historiated borders, 28 historiated initials, and 24 calendar illustrations in tempera and gold. Text pages have shell gold trompe-l’oeil borders. The illuminators include Simon Marmion, the Master of the Houghton Miniatures (named for this manuscript), the Master of the Dresden Prayerbook, and one of the Ghent Associates. The goal of analysis was to determine if identification of palettes supported previous stylistic attributions. Focusing on the illuminations attributed to Simon Marmion and the Houghton Master, we demonstrate that technical analysis can support attribution by identifying differences in artists’ pigment preferences, pigment blending, and technique of paint application, particularly how the artists render shadows. The Emerson-White Hours (MS Typ 443–443.1, Houghton Library, Harvard University) is a book of hours-missal that includes a wide range of liturgical texts and an extensive program of illumination executed in Bruges, Ghent, and Valenciennes ca. 1480. 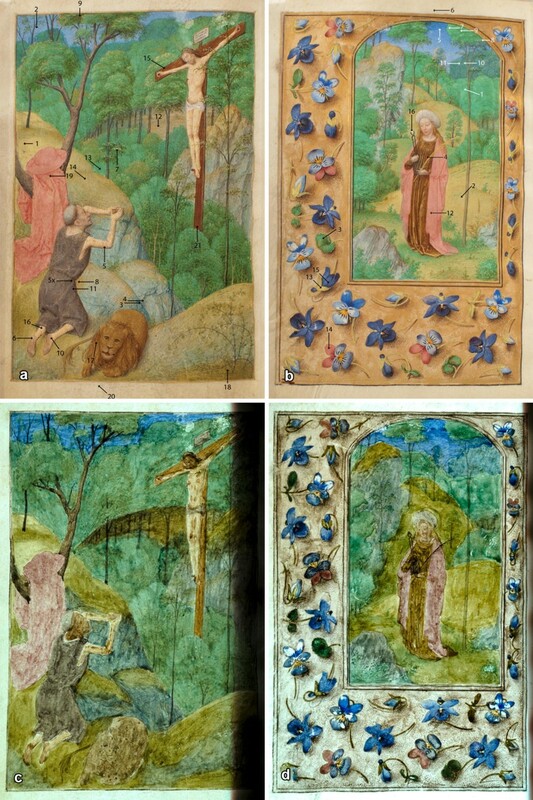 The manuscript’s miniatures, historiated initials, and borders have been listed , the manuscript has been described and discussed [2–4], and color images of the entire work can be found online . The term “Hours” refers to the series of prayers that are said throughout the day, which are referred to by their time of day in Latin: matins or lauds (upon rising), prime (first hour, or 6:00 a.m.), terce (third hour, 9:00 a.m.), sext, (sixth hour, noon), nones (ninth hour, 3:00 p.m.), vespers (early evening), and compline (before sleep). In addition to standard texts found in books of hours—calendar, Hours of the Virgin, Hours of the Cross, Hours of the Holy Spirit, Suffrages to the saints, Penitential psalms and litany, Office of the Dead—the manuscript contains a considerable number of additional devotional texts, including the Psalter of St. Jerome, the Psalter of the Passion, votive masses, and various prayers. Both the content and the decoration indicate that it was a bespoke work, and the richness and complexity of its decorative scheme, as well as the quality of its execution, make it one of the finest books of hours produced in Flanders at that time. At present the manuscript consists of 248 vellum leaves, or folios (f.), measuring ca. 143 × 104 mm. Since 1892, the manuscript has been bound in two volumes foliated, or numbered, consecutively: folios (ff.) 1–118, 119–248. Because both volumes are very tightly bound and because of the fineness with which the parchment was prepared, the collation, that is, the present structure of the gatherings or quires (two or more bifolia nested together), had not been worked out until the current project. The text, written in a single gothic rotunda hand in one column, appears to be complete. The lavishness of the decorative program is indicated by the fact that every original written page has some illumination and by the circumstance that several major artists of the period contributed miniatures and historiated borders. Every significant division of the text, including the subdivisions of the hours, has a full border on the opening page, and each subsequent text page has a panel border in the outer margin. Most of the borders are in the trompe-l’oeil style introduced into Flemish illumination in the 1470s, in which naturalistic flowers, insects, and foliage appear to hover above and cast shadows on colored grounds, most frequently of shell gold, but also including shades of blue, lavender, or gray, and, unusually, several shades of greenish brown. Other border motifs include architectural settings and garden scenes, simulated brocade and embroidered fabrics, representations of jewels and rosaries, cameos of devotional and Biblical subjects, and lattice patterns in which the compartments are filled with letters of the alphabet, flowers, and other objects. Particularly noteworthy are numerous depictions of the instruments of the passion, which, taken together with the choice of texts, document the devotion of the original owners to the passion of Christ. Only seven full-page miniatures remain in the manuscript, with a conjectured 20–40 or more now missing. All the full-page miniatures are found on the versos (v), or back sides of the leaves, facing the beginning of the text to which each relates. The rectos (r), or front sides, of these leaves are blank, even where this creates a blank two-page spread between the end of the preceding text and the full-page miniature. Almost all the texts in the manuscript, including very short texts such as the suffrages to the saints, begin at the top of recto pages, suggesting that they were intended to face full-page miniatures. For the Hours of the Virgin, one would expect a complete set of eight miniatures, and this is confirmed by the presence of historiated borders at terce (f. 157r), vespers (f. 166r), and compline (f. 171r). The miniature of the Annunciation to the Shepherds, now at the J. Paul Getty Museum, Ms. 60 (95.ML.53), is thought to have faced f. 157r. The Hours of the Passion presumably also had a complete set of miniatures, judged from the presence of historiated borders for matins (f. 181r), and nones (f. 194r). Of the 20–40 separated leaves, three have been identified as likely from this manuscript: Annunciation to the Shepherds (J. Paul Getty Museum); Mass of Saint Gregory (Bibliothèque royale de Belgique, Ms. II 3634–6); and Ascension (in a private collection in Belgium) . Close observation of technique with scientific analyses of materials may strengthen or weaken existing attributions based on visual analysis of style , and could help locate additional missing miniatures from this manuscript . Based on stylistic analysis, art historians have attributed the full-page miniatures and some of the historiated borders, listed below . *Raman and XRF spectroscopic analyses were performed on select colors on the folios marked with an asterisk (f. 110v was analyzed with Raman only). Simon Marmion (ca. 1420/1425–1489) was a panel painter and illuminator who worked in Amiens and Valenciennes and collaborated with illuminators in Ghent and Bruges [3, 4, 13]. The Master of the Houghton Miniatures was an anonymous illuminator who probably worked in Bruges. His work, which has only recently been identified on the basis of his distinctive style, is associated with that of Hugo van der Goes (ca. 1440–1482), one of the most influential Flemish painters of his time [3, 4]. The Ghent Associates were a group of anonymous illuminators who worked in Ghent and Bruges in the second half of the fifteenth century . The Master of the Dresden Prayerbook was an anonymous illuminator who worked principally in Bruges in the late fifteenth and early sixteenth centuries . *Raman and XRF spectroscopic analyses were performed on select colors on the folios marked with an asterisk (f. 110v was analyzed with Raman only). The technical examination described in this article was undertaken jointly by the Weissman Preservation Center of the Harvard Library and the Straus Center for Conservation and Technical Studies of the Harvard Art Museums, for the purpose of determining whether the artist attributions based on stylistic assessment would correlate with differences in choice of pigments or manner of application, as determined from technical analysis and microscopic observation. Focusing on the illuminations attributed to Simon Marmion and the Houghton Master, we demonstrate that technical analysis can support attribution by identifying differences in artists’ pigment preferences, pigment blending, and technique of paint application, particularly how the artists render shadows. While Simon Marmion and the Houghton Master were the focus of our analyses, the results and discussion below suggest that such technical study and analysis could be useful for resolving disputes about attribution and potentially for distinguishing artists within a larger group such as the Ghent Associates. Technical analysis of the book of hours was undertaken in conjunction with a conservation project to examine and consolidate flaking and powdery media in preparation for digitization of the entire manuscript prior to its exhibition. A team of six conservators at the Weissman Preservation Center, Harvard Library, performed the conservation work over 18 months. All 248 leaves of the manuscript were closely examined under various lighting conditions (transmitted, raking) and using a stereomicroscope. Both volumes were treated following the Weissman Consolidation Protocol . Because of the high artistic and research value of this book of hours, detailed notes on each leaf were recorded in a spreadsheet. The goal was to tabulate visual observations that could potentially identify the original sequence of the manuscript, such as earlier binding and collation evidence, possible locations of missing leaves, and artist attributions. In addition, compiling notes as part of the treatment procedure improved the visual acuity of the conservators and provided a platform to share information among the team. 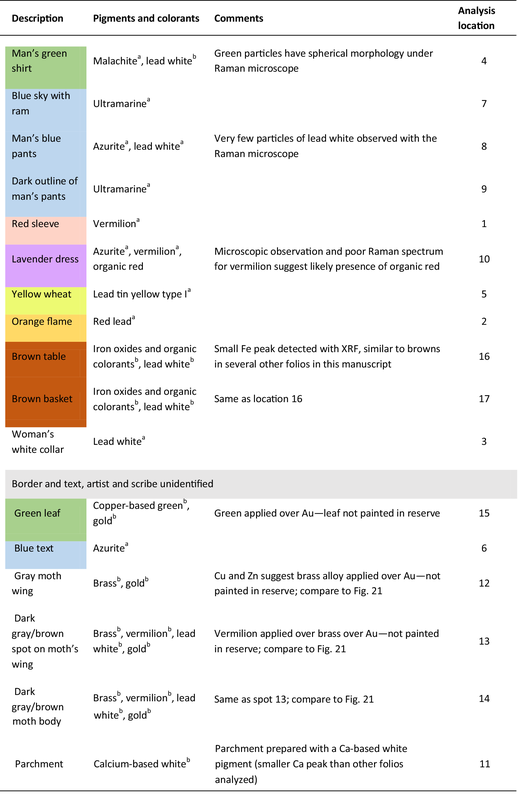 The spreadsheet recorded areas of pigment transfer related or unrelated to the pigments on the facing leaf; evidence of page trimming that removed or bisected graphite foliation numbers; unused sewing holes; pink and green stains and associated fibers in the gutter margins, indicating removal of “silk curtains”, small squares of fine fabric sewn or adhered to manuscript leaves (a medieval practice to protect miniatures from rubbing). 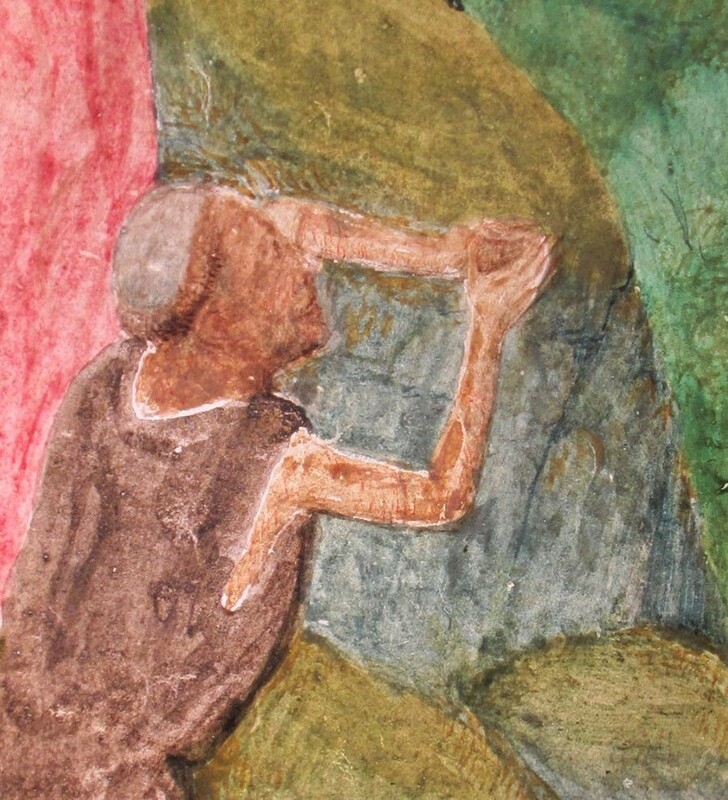 Observations were also recorded on the materiality of the painterly technique, such as color palette, brush strokes, fineness or coarseness of pigment preparation, and presence of underdrawing. Examining each folio with transmitted light was extremely helpful for comparing illuminations attributed to different artists. A fiber optic light sheet was placed beneath each illuminated parchment leaf. The light transmitted by the leaf revealed and emphasized aspects of the artist’s technique, providing insight into the artist’s painting style by revealing the manner of paint application, layering of paint, degree of paint transparency, and brush strokes. Capturing overall and detail images in transmitted light proved to be indispensable for evaluating and discerning the styles of the different artists. Collation diagrams were also prepared for each volume. Where the tight bindings prevented access, the collation was determined by inserting a small slip of paper through the gutter behind the sewing and through the nesting bifolia (singular, bifolium: a sheet of parchment folded in the middle to make two folios). Where the slip of paper exited was presumed to be a conjugate leaf unless repairs or guards suggested that single leaves had been joined. Other features noted on the collation diagrams included quire marks (a letter or number normally placed on the back page of the quire, or gathering, to facilitate arrangement during binding), sewing thread, and the presence of guards or repairs. The identification of hair and flesh sides of the vellum leaves was recorded on both the spreadsheet and the collation diagram, to identify possible interruptions in “Gregory’s Rule”. This medieval practice of collating parchment leaves of manuscripts so that the hair sides faced each other and the flesh sides faced each other was named for the first person credited with noting the practice, Caspar Rene Gregory (1846–1917) . In this manuscript, it was not always possible to ascertain the hair and flesh sides because the parchment was so finely prepared, very thin (approximately 3–3.5 mils, 75–90 microns), generally quite white, and often without much evidence of hair follicles. Despite this drawback, the collation diagrams have provided insights and are useful in reconstructing possible locations of missing leaves. In their present state, after one or more rebindings, the volumes are generally composed of four bifolia per quire, but with a fair amount of variation. Quires vary from two to 13 leaves (ff. 106r–118v) and in one instance, a single leaf is hinged to an adjacent two-leaf quire (f. 187). There are 16 quires in volume 1 and 17 in volume 2. Of these 33 quires, six contain only one or two bifolia (two or four leaves). These inconsistencies suggest the removal of a significant number of leaves during the disbinding and rebinding of the manuscript into two volumes, or during earlier interventions. As the collation diagram revealed, almost every quire has been guarded around the outside of its outermost bifolium. This regular reinforcement of the fold is a common bookbinding practice prior to resewing a book. Whether or not the outer folios were completely broken and repaired, or were pieced together from singletons (single leaves consisting of a half sheet of parchment instead of a sheet folded in the middle) cannot be determined. Some guards that connect the parchment leaves could have been part of the original manuscript production, but the outer guards can be assumed to be a later addition. There are 48 singletons in the manuscript: 28 in volume 1 and 20 in volume 2. This is an unusually large proportion of the leaves (about 20%) and is probably due to both the removal of leaves, as mentioned above, and the assembly of the work of so many different artists. When combined with codicological collation, textual content, and image sequence, the presence of the single leaves may help identify the locations and likely content (including illuminations) of the removed folios. For the primary artists represented in the manuscript, most illuminations are painted on singletons. Of the five illuminations attributed to the Houghton Master, three, ff. 99v, 100r, and 171r, are singletons. It is unclear whether the illuminated ff. 166r and 216r are singletons or not, as they form the last and first leaves of their quires, respectively, and both are guarded. Of the two illuminations possibly attributed to the Houghton Master, f. 92r is a singleton, but f. 119r is again unclear as it is the first folio of the quire and guarded. All three illuminations attributed to Simon Marmion, ff. 14v, 108v and 115v, are singletons. The three illuminations attributed the Ghent Associates, ff. 102v, 110v, and 112v, are also singletons. The illuminations attributed to the Master of the Dresden Prayerbook follow a different pattern. Each labor of the month has two illuminated calendar roundels and these folios form the first two quires of Volume 1, ff. 1v–13r. All are conjugate except the final leaf, f. 13r, which is a singleton. All of the illuminations in both volumes were examined microscopically and with transmitted light. These examinations helped identify the folios selected for further analysis. 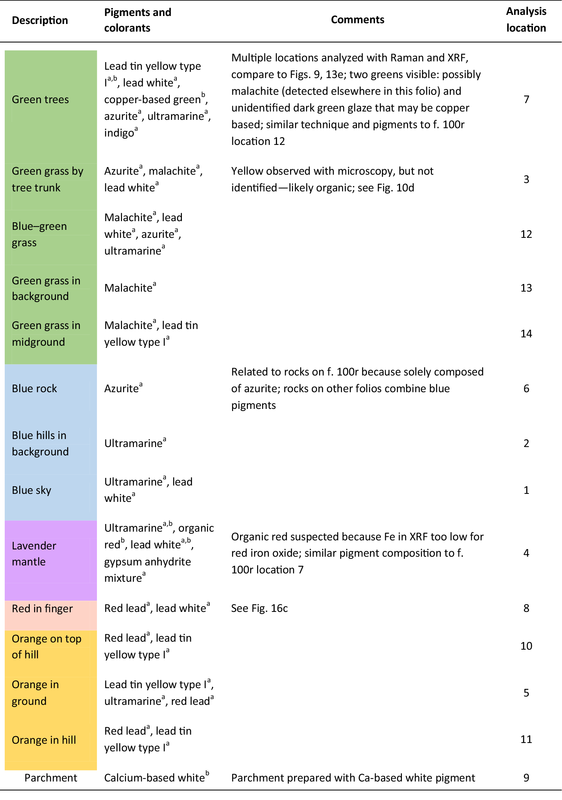 Twenty-seven folios were analyzed spectroscopically for pigment identification. Eleven of the folios were full-page miniatures, initials, and full borders attributed to Simon Marmion, the Houghton Master, the Ghent Associates, and the Master of the Dresden Prayerbook (ff. 13r, 14v, 99v, 100r, 108v, 110v, 112v, 119r, 166r, 171r, and 216r). Sixteen illuminations were unattributed miniatures and borders (ff. 31r, 52r, 65v, 69r, 90r, 120r, 155v, 156r, 157r, 164v, 175r, 181r, 187r, 190r, 191r, and 194r) analyzed for comparison, and to broaden our general knowledge of pigments in use in this area at this time. For most colors, one or two areas on each folio were selected for analysis. In total, over 300 different locations were analyzed by XRF or Raman, with both techniques used on over 50 spots to obtain the most precise identification possible. Ten of the attributed folios were documented with infrared (IR) photography (ff. 13r, 14v, 65v, 99v, 100r, 102v, 108v, 110v, 112v, and 115v) and eight were documented with infrared reflectography (IRR) (ff. 14v, 65v, 99v, 100r, 112v, 119r, 166r, 181r, 200r, and 216r). The X-ray fluorescence (XRF) spectrometer and the Raman spectrometer have specific geometries that limit access to three-dimensional objects being analyzed. These physical constraints made analysis of areas near the gutter difficult or risky for the object, and thus passages for analysis were identified in the middle and outer portions of each folio, where possible. To ensure safe handling throughout the analyses, a supportive book cradle was specially designed to fit the equipment geometries while making certain that the binding was not put under strain, that the particular folio being analyzed would lie flat horizontally, and that the entire manuscript was well supported. The open manuscript volume was secured to the cradle with polyethylene strips. During infrared imaging, the same cradle and strapping technique were used, but the cradle was placed vertically so the manuscript page being documented was positioned normal to the camera. Miniatures were examined with reflected light at 7–100× magnifications with a Leica MZ16 stereomicroscope (.63 objective, 10× binocular eye-pieces, and adjustable Ergo tube 10°–50°) and a Leica KL 1500 LCD fiber optics system. Images were captured with a Leica IC80 HD camera and processed with LAS, Leica Application Suite Software. A LuminousFilm fiber optic light sheet was placed beneath the manuscript leaves and images were captured with a Canon EOS digital camera mounted on a copy stand. Digital infrared photographs were taken with a Phase One P45 + 39 megapixel digital camera back mounted on a medium format camera body. The camera detector was a silicon charge-coupled device (CDD) sensitive in the near infrared up to wavelengths of ~ 1.1 microns (1100 nm). Images were collected with CaptureOne software and adjusted with Adobe Photoshop CS5. Infrared reflectograms were acquired with an Inframetrics InfraCAM-SWIR infrared video camera using an electrically cooled 256 × 256-pixel platinum silicide detector. A 1.5–1.8 micron bandpass filter was used (1500–1800 nm), and images were captured using an MRT Micro Inc. (now Intelens Corp.) VideoPortPro card. A Bruker Artax XRF spectrometer with a Silicon Drift Detector (SDD) was used to perform non-destructive elemental analysis. The spectrometer is equipped with a rhodium anode X-ray tube and the primary X-ray beam is collimated to a spot size of around 0.65 mm at the sample surface. Spectra were acquired for 60 s live time using 600 μA current and 50 kV accelerating potential, without excitation beam filters. Helium was used to increase the detection efficiency for light elements by displacing air from the X-ray beam path between the source and the sample and between the detector and the sample during analysis. The XRF analysis provided information on the chemical elements present in the spot analyzed, from which the likely pigment species can be deduced. Elements lighter than Mg cannot be detected with this XRF system and quantification was not possible due to both the presence of light elements and mixtures of phases within a single analysis point. During analysis, an acrylic sheet was placed under the folio being analyzed to prevent interference of elements on adjacent folios, and where possible, care was taken to select analysis locations without ink or paint on the verso. While the manuscript was at the Weissman Preservation Center for treatment, a Bruker Tracer III–V handheld XRF spectrometer was also used to perform non-destructive elemental analysis. The spectrometer was equipped with a rhodium anode X-ray tube and the primary X-ray beam was collimated to a spot size of 3–4 mm. Spectra were acquired for 90 s live time using 4.5 and 1.5 μA currents and 40 kV accelerating potential, without excitation beam filters. A vacuum was used to increase the detection efficiency for light elements and an acrylic sheet was placed under the folio being analyzed, as above. The Raman spectrometer is a Bruker Optics Senterra dispersive Raman microscope with an Olympus BX51M microscope (20× and 50× long-working-distance objectives). The Raman spectrometer is equipped with 532, 633, and 785 nm excitation laser sources, used on settings of 2, 5, or 10 mW, respectively. These settings have low enough power to prevent damage to the artifact, while having high enough power to give a Raman signal. Certain pigments are more easily detected with specific wavelength lasers, therefore a combination of the 3 lasers was used in this study. Using Opus software, the spectra were compared with several reference libraries. The most useful were the RRUFF database  and the reference library from the Museum of Fine Arts, Boston, based on the Forbes pigment collection . Raman analysis identified specific minerals or compounds based on their molecular properties and hence established the exact pigment present. As this is a microscopic technique, individual particles were analyzed and several analyses were required at each location where a mixture of pigments was present. The information obtained was complementary to that provided by XRF. Not all phases could be identified by Raman spectroscopy and some areas gave a poor analytical signal, possibly due to the presence of organic phases, such as binding media. 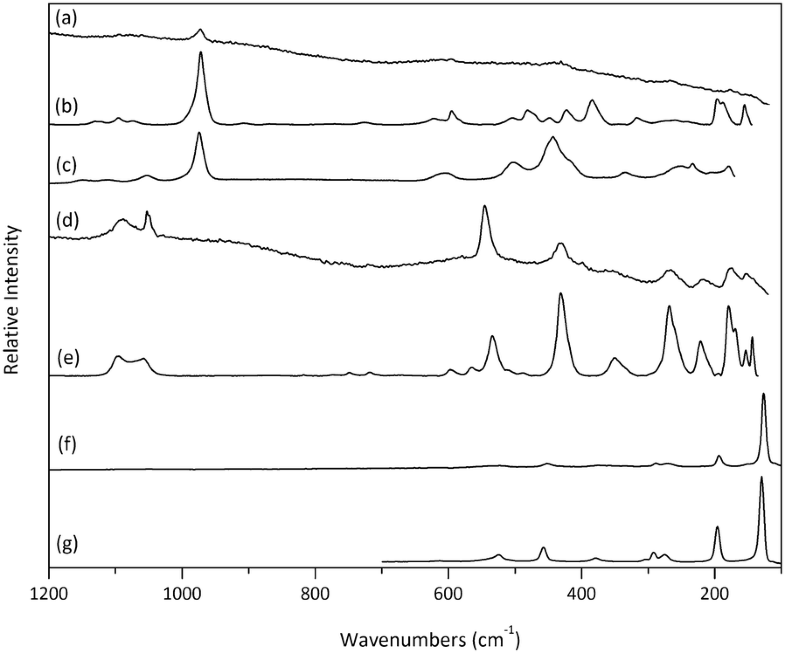 The Raman system did not produce good spectra from reference samples of red or yellow organic colorants, such as madder, Brazilin, or saffron, and was thus also unable to identify these in the manuscript. Raman analysis of the reference samples of the organic blue colorant, indigo, gave distinctive spectra that could be matched to those obtained in some areas of the manuscript. Based on the significance and nature of the object, analyses were restricted to non-sampling techniques. They were performed at the temporary off-site location of the Straus Center for Conservation and Technical Examination and time for the analyses was limited to approximately 5 days of Raman, 3 days of XRF analysis and 2 days of infrared imaging. For efficiency, locations of the colors of interest on each illumination were identified prior to transport to the Straus Center. Each passage of interest was examined with a stereomicroscope immediately prior to analysis, so that each pigment and colorant of interest were investigated. As Raman identifies specific molecules or compounds, it was performed first on all illuminations. Pigments that did not yield good Raman data were noted and then analyzed at a later date with XRF. XRF analysis was used in preference to Raman in areas suspected to have metallic pigments, such as gold and silver, to provide elemental information. Additional XRF analysis was conducted at the Weissman Preservation Center, as mentioned above. The accompanying Tables 1, 2, 3, 4, 5 and 6 identify pigments and colorants in the illuminations selected for discussion. Results of the analyses are arranged by color, with pigment or colorant identifications and corresponding analysis technique(s) indicated. Raman spectra for the characteristic pigments and colorants used in the manuscript are shown in Fig. 10 (green and yellow), Fig. 13 (blue), and Fig. 16 (red). XRF spectra for an unusual green–brown color made from powdered brass are shown in Fig. 21. The pigments and colorants identified were ultramarine, indigo, azurite, malachite, copper sulfate, lead tin yellow type 1, yellow iron oxide, red iron oxide, vermilion, red lead, brown iron oxide, lead white, carbon black, shell gold, shell silver, a powdered brass pigment here identified as shell brass, and by deduction, organic yellow and organic red. In most cases where Raman analysis yielded usable spectra, pigments were easily identified from the Raman databases mentioned above. For example, blue pigments were distinguished based on their Raman peaks: ultramarine, strongest band at 542 cm−1 and weaker band at 258 cm−1; azurite, strongest band at 403 cm−1 and weaker bands at 250, 767, 839, 1098 cm−1; indigo, characteristic peaks at 253, 544, 598, 1573 cm−1. Spectra for the pigments ultramarine and azurite, and the colorant indigo are reproduced in Fig. 13. Several pigments such as copper sulfate and colorants such as organic red and yellow were more challenging to distinguish. Copper sulfate was identified based on the presence of a clear Raman peak around 973 cm−1 in green phases for which XRF analysis revealed high levels of copper. The green copper sulfate may be brochantite (Cu4SO4(OH)6) and/or posnjakite (Cu4(SO4)(OH)6·H2O), similar compounds that differ only in their degree of hydration. The peak at 973 cm−1 may be brochantite (strongest peak 971 cm−1) or posnjakite (strongest peak 975 cm−1), or a mixture of the two . Differentiation between the two phases relied on assignment of minor peaks (including a fairly strong peak at 443 cm−1 in posnjakite) and slight differences in OH vibrations of the peaks in the region from 3200 to 3600 cm−1. These lower intensity peaks were rarely visible in the fairly weak Raman signals obtained from in situ analysis of the folios. In a few instances, the presence of minor peaks suggested that posnjakite, brochantite, and mixtures of the two were present in the green pigments used on the manuscript. The presence of mixtures of the two sulfates is not unexpected as they differ only in hydration and may occur together in nature and in synthetic mixtures. Spectra for the pigments copper sulfate, malachite, and lead tin yellow are reproduced in Fig. 10. The organic red(s) present in the manuscript could not be identified, but their presence was inferred from microscopic observation of the red colorants and the lack of characteristic elements detectable by XRF, except Al. In all cases, the attempted Raman analysis of organic red colorants yielded no further information due to the overwhelming fluorescence of the organic red itself. When examined with ultraviolet light, no visible fluorescence was observed, suggesting that the organic red colorant was unlikely to be madder. Spectra for the pigments vermilion and red lead are reproduced in Fig. 16. Similarly, no organic yellow(s) were identified due to the lack of characteristic elements detected by XRF analysis and no identifiable peaks in the Raman spectra. Identification of organic yellows typically involves sampling for analysis by chromatography mass spectrometry, which was not possible for this manuscript. Several full borders painted with an unusual green–brown background color were determined to be based on powdered brass from XRF analyses that found high levels of copper and zinc, moderate amounts of lead, and trace amounts of iron in these colors. While all of the copper greens showed trace amounts of zinc, these green–brown colors had significant peaks for zinc in all cases analyzed. Seven folios with shades of the green–browns from light olive to dark green–brown were analyzed. Spectra for two different tonalities of this color are reproduced in Fig. 21. In this manuscript Simon Marmion uses a limited and distinctive color palette consisting primarily of lime-green, greenish yellow, pale organic red, and brown (Fig. 1). He occasionally uses blues and other colors in addition to this core palette, as in the illumination of St. Christopher (f. 115v). With transmitted light examination we observe that Marmion applies paint thinly and uniformly, in color fields with defined contours. The borders of the color fields are executed in a fairly precise manner and rarely overlap. Notice the fine scraping of media that defines the edges of the clothing and the flesh in the neck and shoulder of St. Jerome (Fig. 4). Marmion’s brush strokes are generally broad and vertical in orientation. Overall translucency and luminosity are achieved by the thin media application and pigment selection. In reviewing the transmitted light images in conjunction with spectroscopic analysis for pigment identification, we conclude that Marmion’s use of organic colorants and mineral pigments with low to moderate refractive index (except greens) contributes to the overall translucency of his illuminations in transmitted light  (see discussion of pigment choices below). The brown used for the base of the flesh tone is readily seen in transmitted light on the face and arms of St. Jerome. The illuminations overall have a color-by-number appearance with the fine detail added last. Marmion’s style of painting illuminations is likely drawn from his background as a skilled panel painter [13, 14]. In contrast, The Houghton Master uses a broad color palette with wide variations in color value. The colors are often a complex mixture of different pigments blended together. Many colors are applied fairly wet with media pooled around the extreme edges of the application (Figs. 2, 3a, c). 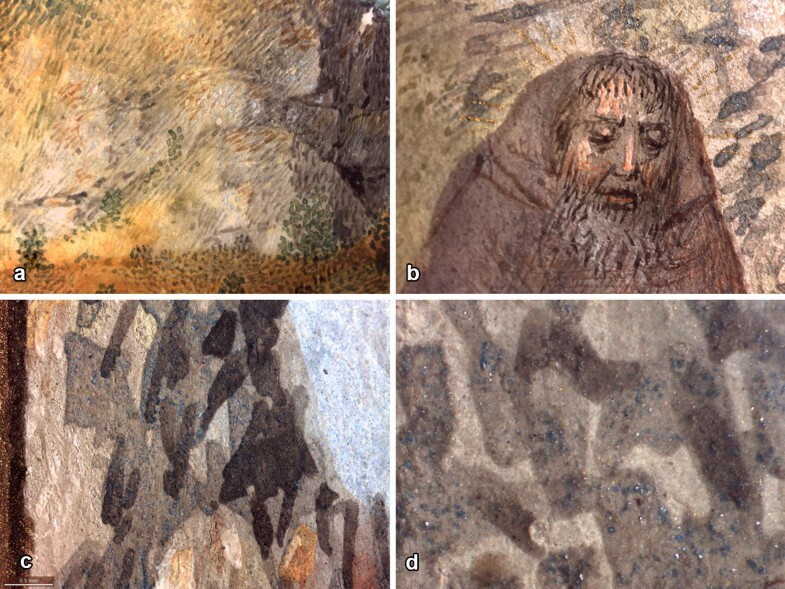 The thick deposits of pooled color are often cracked and have suffered losses (Fig. 5). One color field or shape often blends and overlaps into another with few distinct boundaries. Brush strokes are prominent and multidirectional, sometimes dashed or dotted in an impressionistic and pointillist manner, yielding subtle variation of tone. The Houghton Master’s work is not as transparent as the work of Marmion because of the thicker paint application and pigment selection. 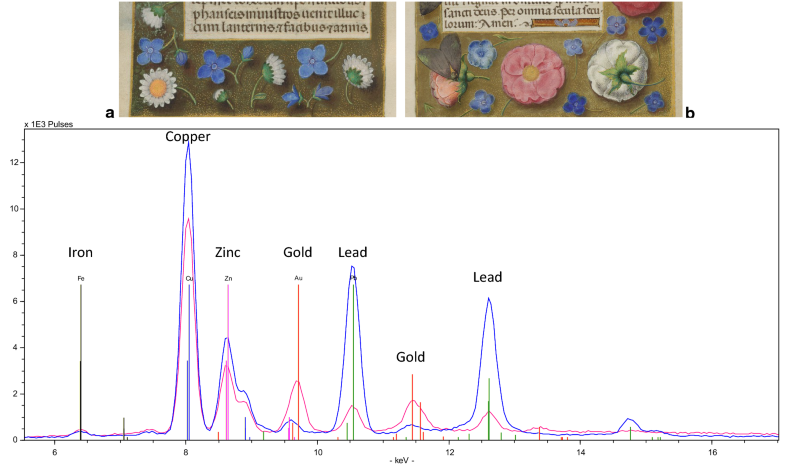 In reviewing the transmitted light images after spectroscopic analysis for pigment identification, we conclude that the Houghton Master’s frequent use of mineral pigments with moderate to high index of refraction (lead white, red lead, lead tin yellow) contribute to the more opaque appearance of his illuminations in transmitted light . Infrared (IR and IRR) photography was performed on eleven illuminations attributed to the Master of the Dresden Prayerbook, the Ghent Associates, Simon Marmion, the Houghton Master, and one unidentified border with a historiated initial attributed to the Dresden Master. The goal was to find evidence of underdrawing that might provide clues to individual artistic style and design layout. It was a surprise to us that no underdrawing was visible in any of the illuminations examined. The IR images, however, do supply important information supporting our observations on the contrasting working habits of Simon Marmion and the Houghton Master [16, 17]. The IR image (Fig. 6) captures Marmion’s working habit of painting with defined color boundaries, especially detected in the green foliage. 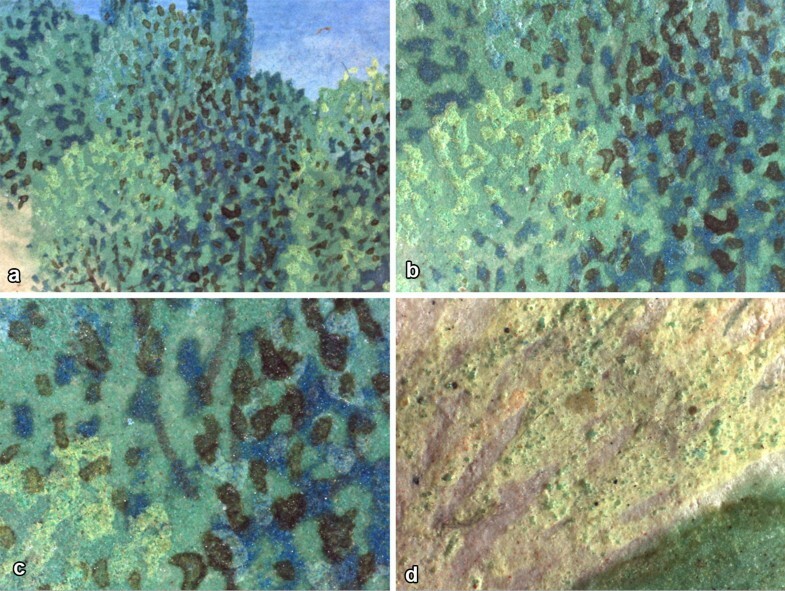 The green foliage in the illuminations by Marmion is dark in the IR images due to the presence of copper-based pigments, which efficiently absorb IR (see discussion of green pigment choices below). The foliage areas broadly painted with both malachite and copper sulfate result in an even darker IR image (Fig. 6) than areas painted with malachite alone. This appearance may reflect a difference in IR behavior resulting from the layering and/or mixing of pigments, or a denser pigment application. A similar extremely dark appearance in IR was observed for other illuminations with copper sulfate detected over malachite, including illuminations and initials attributed to Marmion, and illuminations attributed to the Ghent Associates. The IR images of the illuminations attributed to the Houghton Master capture his wet application technique and the associated pooling of media at the edges (Fig. 7). This technique is commonly observed in his illuminations and is seen in the shadows of the rocks on f. 100r where azurite is heavily mixed with black, likely carbon black. In general, the IR images of the illuminations attributed to the Houghton Master appear lighter overall than those of Marmion. This supports the analytical findings: the Houghton Master used many lead-based pigments (lead white, red lead, lead tin yellow), which appear light in IR. In addition, although the Houghton Master used copper greens, the application is in small dabs and strokes, unlike the large areas applied by Marmion. 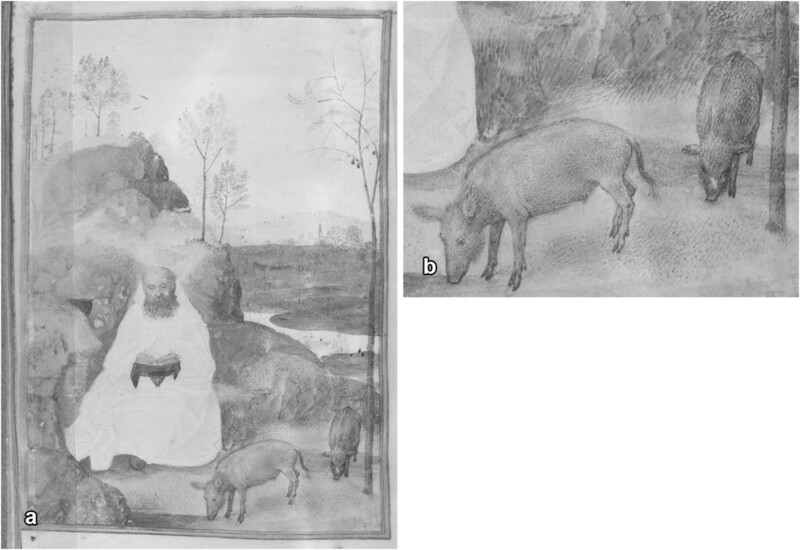 The IR images also illustrate the expressive multi-directional dashed and dotted brush stokes used by the Houghton Master, as seen in the detail of the pig on f. 99v, executed with a brown–black pigment (Fig. 7b). Simon Marmion and The Houghton Master use different green pigments and different painting techniques to depict foliage. The trees in the illuminations attributed to Simon Marmion (ff. 14v and 108v) are painted with a base layer of green composed of malachite and a green copper sulfate. This green base layer is applied uniformly in broad, but defined color fields. Highlights are defined with short, repetitive strokes of lead tin yellow and shell gold; shadows are achieved with a dark glaze (Fig. 8). The use of green copper sulfate is not widely reported in illuminated manuscripts, but has been reported in some fiftieth and sixtieth century works connected to Netherlandish and Flemish panel painters [11, 18–21]. Green copper sulfate, probably both brochantite and posnjakite forms, was also found in an illumination attributed to the Ghent Associates (f. 110v), where it occurs with malachite. Since Marmion was also a panel painter, it is logical that he might be familiar with this pigment. 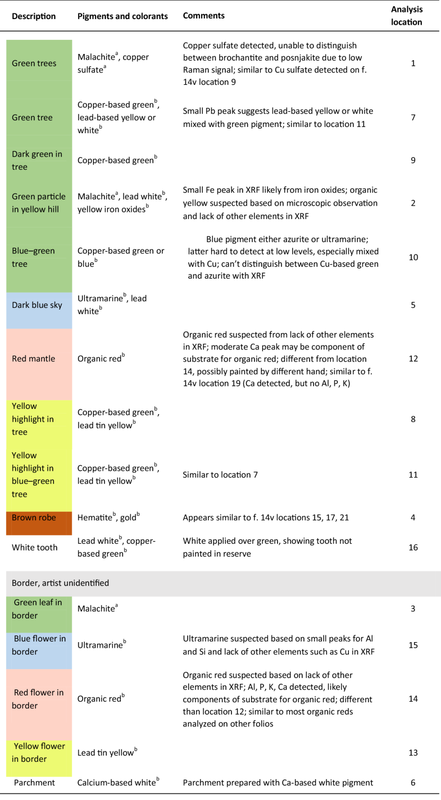 Note that green copper sulfates were not definitively found in the greens analyzed in any of the illuminations attributed to the Houghton Master, where malachite appears to be the green of choice. This difference is one of many found in these artists’ pigment preferences. Marmion achieves definition in the leaves, albeit minimal, with thinly painted brush strokes of a dark green glaze for shadow, and lead tin yellow and shell gold for highlights. The distinctive green–yellow color in the landscape foregrounds contains lead white, iron oxides, and an organic yellow. In contrast, the foliage painted by the Houghton Master (ff. 99v, 100r, and 171r) is made of pigment mixtures with a wide distribution of particle sizes and containing copper-based greens and blues (malachite and azurite), ultramarine, lead tin yellow type 1, lead white, and a dark copper-based glaze. Indigo was also detected in the foliage on f. 99v. The green grassy areas on ff. 99v and 100r contain a mixture of malachite and lead tin yellow type 1 (Fig. 9). Not only are the green pigment preferences of these two illuminators very different, their manner of paint application is also different. The Houghton Master applies paint in layers, often quite thickly. The detail is applied in a staccato, impressionistic manner with adjacent brush strokes having modulation in tone. The complex mixture of pigments and blending of colors to achieve subtle modulation is the hallmark of the Houghton Master’s painting style. Trace amounts of zinc were found in all the copper greens analyzed (ff. 13r, 14v, 31r, 99 V, 100r, 108v, 157r, 166r, and 181r), either from the presence of zinc as an impurity in the natural copper ore or from manufacture of artificial copper-based pigments using copper alloys containing some zinc (Fig. 10, Table 3). Simon Marmion and The Houghton Master both use azurite to paint the grey base tones of rocks, but they use different blue pigments and different painting techniques to depict the shadows defining the rocks. The grey base of the rocks in the illumination attributed to Simon Marmion (f. 14v) is painted with azurite and lead white, outlined with prominent strokes of indigo for shadow and edge definition (Fig. 11b). The paint layers are quite thin and the color modulation is subtle. The rocks have a cool tone and transmitted light emphasizes their distinctive appearance (Fig. 1c). The Houghton Master uses washes of azurite and azurite mixed with lead white to create the grey base tone on ff. 99v and 100r (Fig. 12a, b). Ultramarine was also found in the pale grey of the rocks on f. 171r, which may be from the blue wash application in the sky or may be an intentional scattered application (Fig. 12c, d). Black particles were observed with microscopy, indicating that a carbon black pigment may have been mixed with the blues. Although carbon cannot be detected with XRF, it is suspected because other sources for black pigments contain elements that are detectable and were not found: hematite contains iron, bone black contains phosphorus, etc. The overall tone of the rocks is neutral compared to the distinctly cool tones preferred by Marmion. The rendering of shadows is achieved with azurite, and the paint application is unusual and distinctive. The shadows are applied with a wash of coarsely ground azurite resulting in a heavy deposit of large azurite particles (est. ~ 30 microns) distributed throughout the broad brush stroke and concentrated in the heavy pooling of pigment around the perimeter (Fig. 12). As no sampling was allowed for analysis, measurement was determined by observation through a stereo microscope using Leica image capture and measuring software. 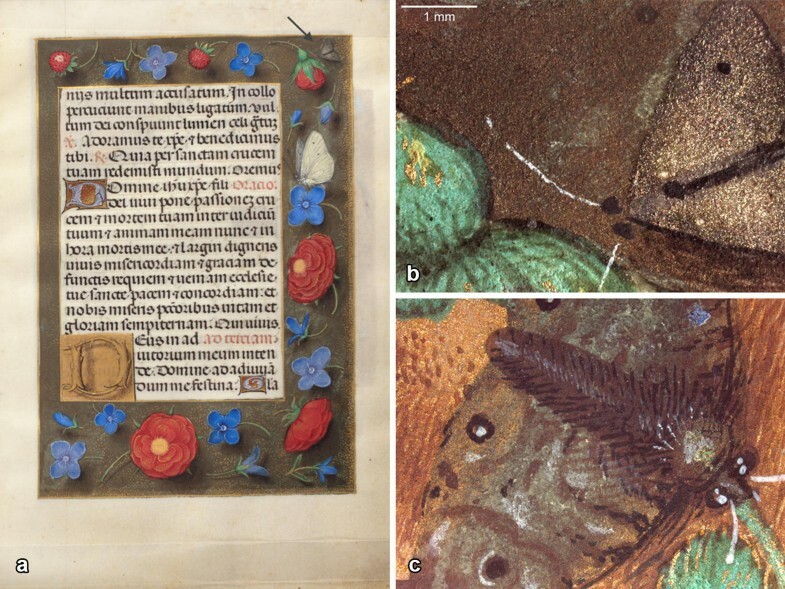 Although not a precise measurement, the particle size of the azurite was distinctly different from the finely ground pigments on this leaf and throughout the manuscript, which were too fine to measure through the microscope. The Houghton Master frequently used pigment mixtures with a wide distribution of particle sizes, as seen in the details of f. 171r (Figs. 9d, 12d) and f. 119v (Fig. 15e). Simon Marmion has a definite preference for organic red colorants. His renderings of the red mantles on f. 14v and f. 108v (Figs. 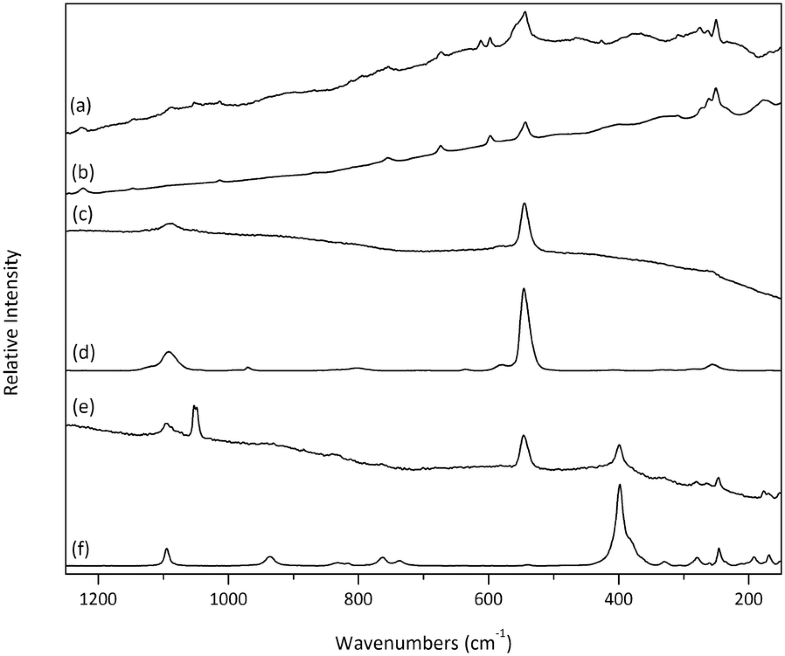 1a, b, 14a) have similar XRF spectra lacking the characteristic elements of mineral reds. In both cases, the clothing is painted with a calcium-based substrate for the unidentified organic red and an unidentified lead-based pigment, suspected to be lead white (though small amounts of red lead cannot be ruled out). Both areas lack significant amounts of the characteristic elements of inorganic red pigments: iron, mercury, and/or lead. 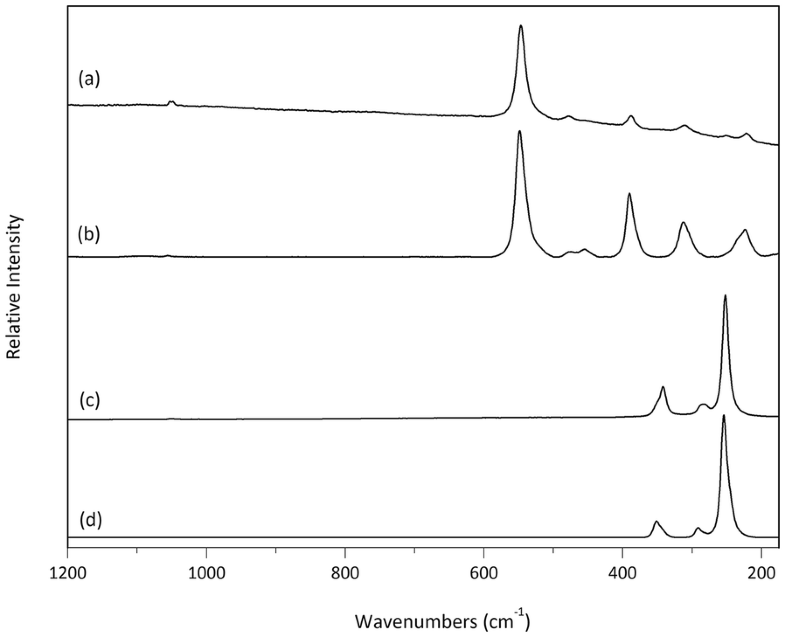 As mentioned above, no characteristic peaks were seen in the Raman spectra from these areas because of the strong fluorescence signal of the organic red itself. Marmion sparingly uses vermillion to paint streaks of blood and mixes it with lead white to make flesh tones (Fig. 14b–d). Reddish brown hematite was found in the cross on f. 14v (Fig. 14c) and the brown robe on f. 108v (Fig. 1b). Red lead was not found alone nor mixed with other pigments on f. 14v, but it may have been used in the face of St. Apollonia on f. 108v based on visual observation. The absence, or possible minimal presence, of red lead is noteworthy. In fact, the very limited use of lead-based pigments is a defining attribute of Simon Marmion. For flesh tones, Marmion uses a base tone of light brown that, when analyzed with XRF, yielded a weak Fe peak, suggesting iron oxides. Although this area did not produce a Raman signal, a weak Raman peak for hematite was found elsewhere on both ff. 14v and 108v. Over this base tone of light brown, he adds highlights of pale pink and pale yellow, made with lead white, vermillion, and probably an organic yellow. Shadows are created with parallel strokes of blue and brown, likely indigo and iron oxides. Dark brown brush strokes also outline the lips, nose, and hair. The Houghton Master, in contrast, frequently uses red lead and vermillion in both clothing and flesh tones (Fig. 15). Vermillion is used on f. 171r for the base tone of the bright red cloak and mixtures of vermillion and red lead are used for the boots (Fig. 15a, b). 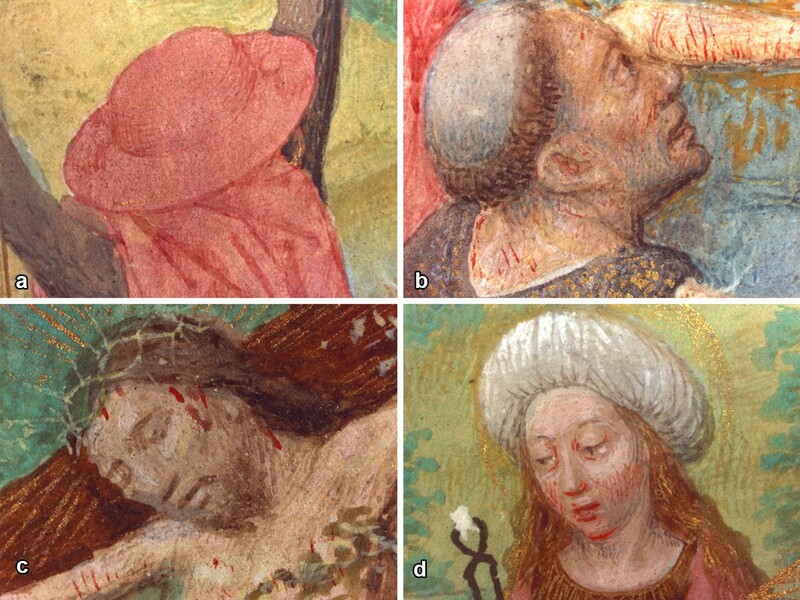 Red lead, vermillion, and lead white are commonly used for flesh tones, as seen on f. 100r (Fig. 15f). Red lead is also a common trace admixture to the various blends used in yellow grass areas in his landscapes (Fig. 9d). A red colorant, likely organic, is combined with ultramarine and lead white to create the lavender colors of the mantle on f. 99v and a cameo on f. 119r, a full border illumination possibly attributed to the Houghton Master (Fig. 15d, e). The organic red was not identified, and is inferred from microscopic observation of the red colorant, and the lack of characteristic elements detectable by XRF. Although Al was detected, it cannot be proven to come from a lake colorant, as the aluminum-containing pigment, ultramarine (3Na2O 3Al2O3 6SiO2 2Na2S), is also present in this area. There was no visible fluorescence of the organic red colorant at 365 nm, suggesting that it is unlikely to be madder lake. In only one instance was an organic red used as the primary pigment: the pale pink cloak on f. 171r (Fig. 15c). However, the pink is modulated with a blue pigment, likely ultramarine, which gives the color a slight lavender cast. The organic red may have been used to further distinguish this cloak from the prominent red cloak painted with vermillion on the same leaf (Figs. 3a, 15a). The Houghton Master rarely uses a single hue alone. 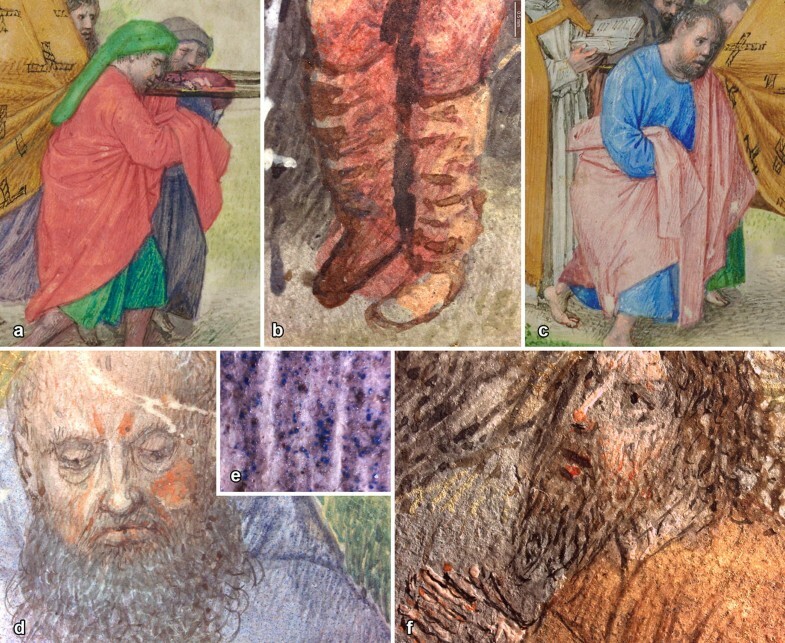 Just as red is part of the earthy yellow ground tones, blue (particularly ultramarine) is a common admixture with browns, as seen in several cloaks on f. 100r (Figs. 3a, 15f). 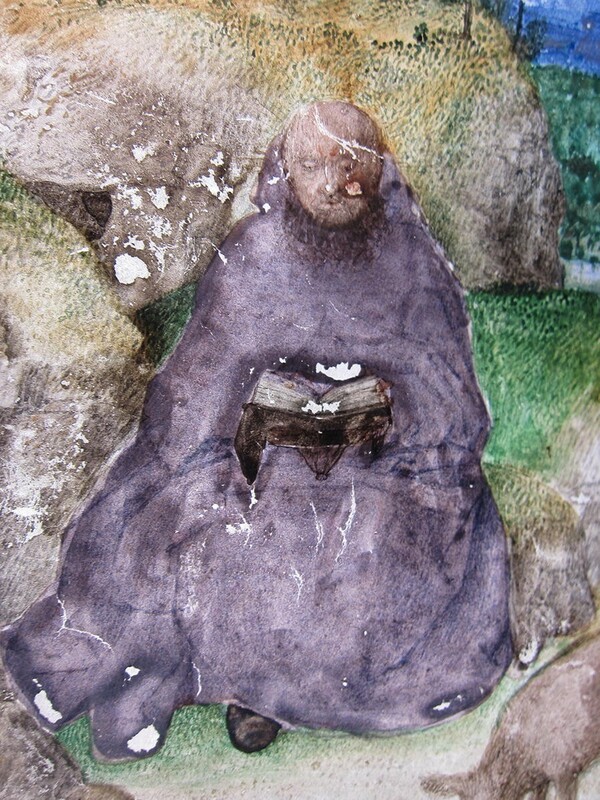 For the faces of monks and pilgrims, the Houghton Master uses dark grey which serves as both the base tone and shadow (Figs. 2a, b, 3a, 15a, c, d, f). There is no modeling. Instead, volume and definition are delineated by a few brush stroke highlights composed of lead white, vermillion, and red lead (Fig. 15f). Facial features are further delineated with fine gestural strokes of dark brown or black pigment, or ink (Fig. 16). In addition to the full page illuminations, ff. 14v, 108v, and 115v, there are also five historiated initial miniatures attributed to Simon Marmion, ff. 92r, 100r, 119r, 166r and 171r (Fig. 17) [2, 4]. All five have similar dimensions, are nearly square in shape, and are positioned in the top left corner of the manuscript text. All have a small initial letter applied in shell gold in the upper right, and the initial was painted over the design, as opposed to being incorporated into it. Of the five historiated initial miniatures, three are on pages with full border illuminations attributed to the Houghton Master: ff. 100r (Fig. 2b), 166r (Fig. 19a), and 171r (Fig. 3a). The remaining two miniatures, ff. 92r (Fig. 17e) and 119r, are associated with border illuminations possibly attributed to the Houghton Master. The initial miniatures on ff. 100r (Fig. 17a) and 166r (Fig. 17c) share a similar color palette with Marmion’s full-page illuminations, and similar green and yellow composition of the grass and foliage. Comparing reds, the fire on f. 100r is vermillion, but the red robe on f. 166r (an organic red) and red mantle on f. 92r are similar in appearance to the other organic reds used by Marmion. The miniature on f. 92r (Fig. 17e) was not analyzed for pigment identification, but has the same general visual appearance and media application. The gray chainmail on f. 166r was painted with azurite and lead white outlined in indigo and possibly glazes, similar to the pigment combinations found on f. 14v. In transmitted light (Fig. 17b, d, f) and in the IR images, these miniatures display a similar style of controlled paint application, maintaining defined boundaries of each color field, and have the same overall translucency as Marmion’s illuminations. 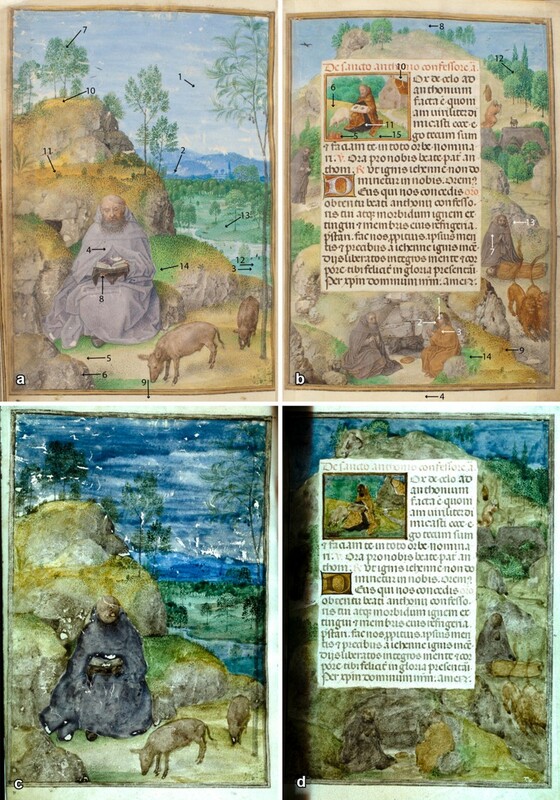 The historiated initial miniatures on ff. 119r and 171r were examined for artistic technique and analyzed with XRF and Raman spectroscopies. However, they are quite different in subject matter and overall palette from the other illuminations attributed to Marmion in this book of hours, making it difficult to draw meaningful conclusions. Kren refers to “several borders with camaieux of biblical subjects” by Marmion, but does not identify the folios . If both the Marmion and Houghton Master attributions are correct, then all of Marmion’s historiated initial miniatures occur on folios with full border illuminations by the Houghton Master. This scenario might provide clues to the overall fabrication sequence and the potential collaboration of at least two of the artists contributing to the production of this complex manuscript. Based on microscopic examination of the 24 calendar roundels, and spectroscopic analysis of two folios, the roundel on f. 13r (Fig. 3b) and the historiated initial on f. 65v, the Master of the Dresden Prayerbook is versatile in his use and blending of a spectrum of colors. The Dresden Master uses the blue pigments azurite and ultramarine blue, and the blue colorant indigo; the red pigments vermillion, red lead, and probably an organic red colorant as an admixture to create lavender; for greens he uses malachite (with a zinc impurity). He does not appear to have used the copper sulfate found in other areas of this manuscript. For yellow he uses lead tin yellow type I; and he uses many tans and browns that are mixtures. His extensive use of browns is clear from examination in transmitted light (Fig. 3d). The results of our pigment analyses match well with results obtained from analysis of another illumination attributed to the Dresden Master, at the Fitzwilliam Museum, Cambridge, England . The Dresden Master is a skilled, but formulaic painter in his design layout and paint application in the Emerson-White Hours. The roundels and borders of grey acanthus leaves mingled with flowers and insects are similar to other illuminations attributed to the Dresden Master . Like the Houghton Master, he mixes two to three different colors, often coarsely ground, to achieve a rich tone. But unlike the Houghton Master, his colors are uniformly mixed. Bold and bright, the application is without tonal modulation, such that an entire piece of clothing has the same overall color value. He then uses a similar pigment or glaze for shadow and definition, for instance a dark green glaze over malachite, as in the vest, ultramarine blue over azurite, as in the pants, and a brown glaze over brown and greys, as in faces, baskets, and tables (Figs. 3b, 18). Highlights are achieved similarly with uniform strokes of a lighter shade of the same color or with shell gold. Faces are rendered with a dark brown base tone similar to the Houghton Master’s depiction of monks, but with broadly applied highlights and features uniformly outlined, in contrast to the refined and expressive brush strokes of the Houghton Master. Overall, the small roundel illuminations by the Master of the Dresden Prayerbook have a cartoon-like appearance. The only metal leaf present in the manuscript was gold leaf used in the text of the Labors of the Month, associated with the calendar roundels (Fig. 3b), but shell gold was found throughout the manuscript. Shell gold, a substitute for gold leaf, was made of ground or powdered gold mixed with a binder, often in a sea shell (hence the name), to form a liquid and applied by brush . Marmion used shell gold to define highlights, typically applying lines and hatch marks over areas of color. 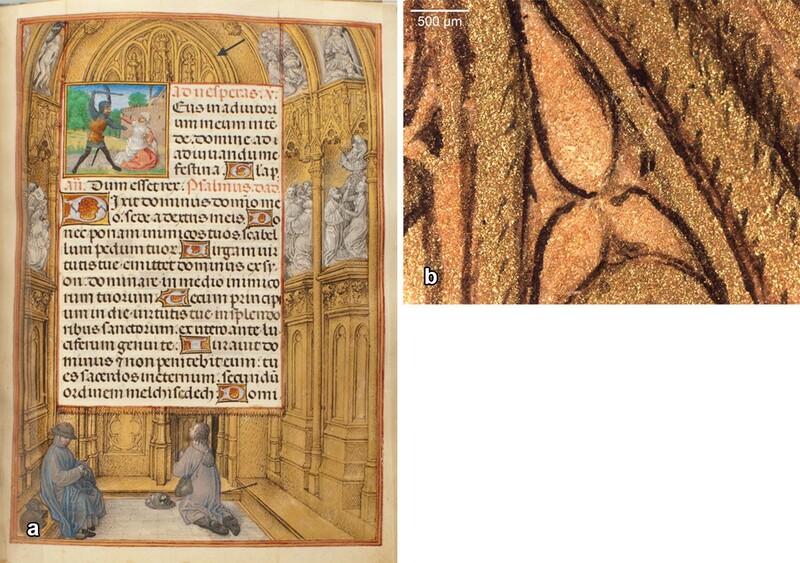 He frequently applied shell gold over browns, for instance to define the wood grain of the cross on f. 14v (Figs. 1a, 14c), the hair and mantle of St. Apollonia on f. 108v (Figs. 1b, 14d) and over browns and pinks in the historiated initials on ff. 110r, 166r (Fig. 17a, c). Marmion used shell gold over the blue of the mantle of Virgin Mary to depict highlights in the historiated initial on f. 171r (Fig. 3a). In St. Jerome in Penitence on f. 14v, he used shell gold over greens to highlight foliage (Fig. 8b), over the grey hairshirt of St. Jerome to create texture (Figs. 1a, 14b), and co-mingled with hematite (and/or other iron oxides) to achieve the golden color of the lion. The Houghton Master also used shell gold, but rarely to define highlights. He favored instead a broad application to indicate a golden color, as seen in the casket cloth, clothing, and angels on f. 171 (Fig. 3a), or he subtlety applied shell gold as a pigment mixture to yield a richer light brown tone, as observed in the robe on f. 100r (Fig. 15f). Both Marmion and the Houghton Master used brush strokes of shell gold to depict halos and rays of light. In addition to the illuminations attributed to various artists, several trompe l’oeil borders with shell gold backgrounds were also analyzed (ff. 119r, 155r, 156r, and 191r). Examination in transmitted light revealed the reflective and solid-looking gold backgrounds to be surprisingly translucent. Additionally, pigment(s) added to or applied with and on the shell gold are visible as a base tone in the transmitted light images of the borders on f. 108v, where the miniature is by Simon Marmion, and on f. 13r in the calendar roundel by the Master of the Dresden Prayerbook (Figs. 1d, 3d). In general, red lead was the primary pigment found mixed with the shell gold (Fig. 16), but combinations of iron oxides and red lead were also used to modulate the value and warmth of the gold tone. In some cases, the shell gold was applied with only the slightest amount of added pigment to achieve the lightest and brightest golden tone possible. This application was observed on the gold outlines of bar borders and was confirmed by analysis of f. 191r, an unattributed border. In the illumination Pilgrims at a Church Door (f. 166r), attributed to the Houghton Master, the tonal variations in the golden chapel arch were achieved by varying the amounts of red pigments added, while also varying the density of the shell gold application (Fig. 19a, b). Throughout the manuscript, zinc and copper were identified in significant amounts in the green–brown backgrounds of several full borders (Figs. 20, 21), strongly suggesting the use of a powdered brass pigment, here identified for the first time as shell brass. The color is unusual and ranges from a very dark green–brown (ff. 72v, 120r, 245v) to a light, olive green–brown (ff. 93r, 101r). XRF spectra show similar elemental compositions for the dark green–brown on f. 72v (Fig. 21a) and the olive green–brown on f. 101r (Fig. 21b). As with the tonal variations in shell gold discussed above, variations in the shell brass were likely achieved by adding other pigments. All of the shell brass areas examined had significant amounts of copper and zinc, moderate amounts of lead, and trace amounts of iron. Shell gold was sometimes brush applied on top of shell brass backgrounds in dots and lines, giving the overall appearance of a darker gold color field. In areas of thin or uneven application, or where abraded, a paler green tone is clearly visible beneath (Fig. 20b). It could not be determined if this green tone was applied as an underlayer or was an alteration of the parchment by reaction with copper, but the green tone is also visible on the reverse of the parchment leaf in these areas, suggesting the latter. The large greenish–gray moth in the upper right corner of f. 13r (Fig. 20c) was also executed with shell brass. High levels of copper and zinc were detected here, and like the borders mentioned above, the shell brass was probably mixed with other pigments or deliberately toned to achieve the greenish brown colors (Fig. 21). It can be noted that shell silver was also found in several locations. Silver was detected in the moths on ff. 120r (Fig. 20b) and 156r, and in details of other illuminations, such as a sword on f. 119r, a shield on f. 190r, and in a building on f. 194r. The silver moths and sword have discolored and darkened due to reaction with pollutants in the environment (chlorine and/or sulfur) and there is a corresponding grey discoloration on the reverse of the parchment leaf. 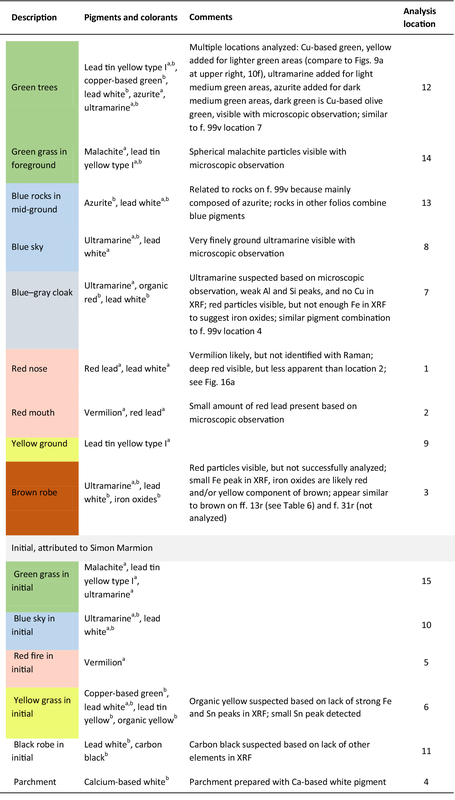 The works of Simon Marmion and the Master of the Houghton Miniatures are distinguished from each other by the artists’ preferences for different green pigments for foliage, by their different usages of red pigments and colorants for drapery, and blue pigments and colorants for rocks and shadows, by differences in color blending, and by their different sequences and manners of paint application. 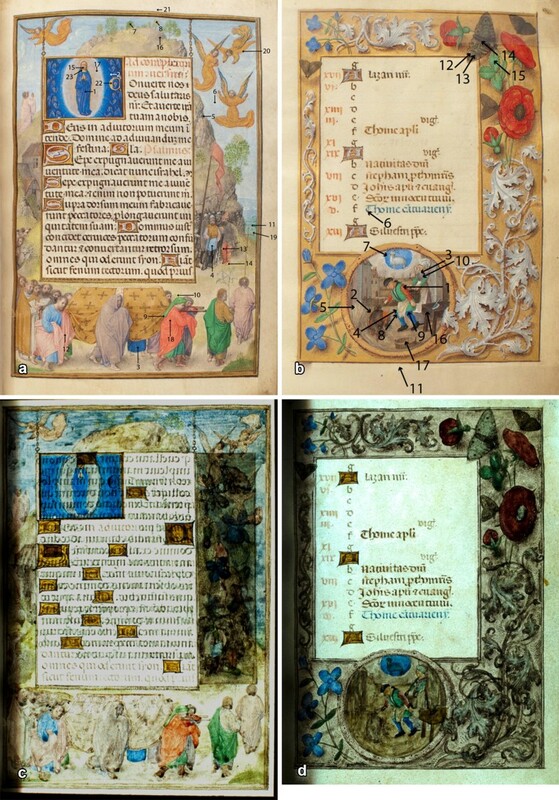 The observations and data generated by our technical study support the artistic attributions of illuminations in the Emerson-White Book of Hours to Simon Marmion and the Master of the Houghton Miniatures. Based on what we have learned from studying illuminations with strong attributions, it may be possible to categorize the data gathered from illuminations attributed to the Ghent Associates and from the unattributed illuminations. The results of this project also provide a basis for future study and analysis of illuminations likely removed from the manuscript, and for identifying the probable locations of their original sequence within it. The techniques employed were visual observation enhanced by magnification and transmitted light, infrared photography, and pigment and colorant identification using XRF and Raman spectroscopies. 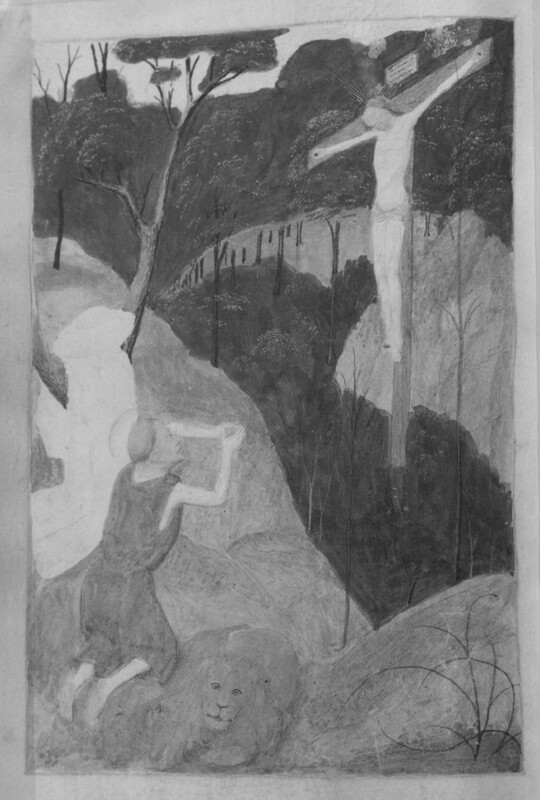 Examination in transmitted light proved to be a valuable and inexpensive method for gaining an overall understanding of an artist’s working technique and should be incorporated into future technical studies of illuminated manuscripts. This combination of observational and analytical techniques may help to distinguish the work of different artists when stylistic attribution has not been possible. In particular, focusing analysis on neutral tones such as browns and greys, which are a challenge for artists to achieve, can highlight the differences in working habits of various artists, and has the potential to provide discriminating insight into the attribution of artists with similar artistic styles. The authors share joint responsibility for the observations, data interpretation, and conclusions drawn. DM initiated the collaborative project, was the project team leader, and was persistent in culling the data for meaningful correlations. HM wrote the introduction and provided crucial art historical and book historical guidance. EM and KE performed the majority of spectroscopic analysis. TJS performed spectroscopic analyses with a handheld XRF spectrometer. EM and KE interpreted the spectroscopic data. TJS compiled and edited the contributions into the final paper. All authors read and approved the final manuscript. This article is an expansion of the poster, Technical Study of the Emerson-White Book of Hours, presented at the conference Manuscripts in the Making: Art and Science, organized by the Fitzwilliam Museum and the University of Cambridge, 8–10 December 2016. The authors extend sincere gratitude to Abigail Quandt for her initial consultation and review of select illuminations; Lieve Watteeuw for suggesting transmitted light examination; Narayan Khandekar, Henry Lie, and the Harvard Art Museums for supporting the project, providing access to analytical equipment at the Straus Center for Conservation and Technical Studies, and for the technical support of Kate Smith with IRR, and Georgina Rayner with XRF; the Weissman Preservation Center conservators who with skill and patience meticulously examined and treated the manuscript: Alan Puglia, Katherine Beaty, Laura Larkin, Christopher Sokolowski, and co-authors Debora D. Mayer and Theresa J. Smith; Katherine Beaty for revisiting the collation diagrams with the authors; Jiuan Jiuan Chen for consulting on infrared imaging terminology; Stella Panayotova and Paola Ricciardi for sharing data on the analysis of works by the Master of the Dresden Prayerbook, as well as organizing the catalogue, exhibition, and conference, Colour: The Art and Science of Medieval Manuscripts, which provided an invaluable forum for exchange of ideas between researchers; The J. Paul Getty Museum for sharing images of the manuscript; and the Houghton Library, the Weissman Preservation Center, and the Harvard Library for their support of this research. The analytical results (compiled in 27 spreadsheets, one for each folio analyzed), collation diagrams, IR and IRR images, transmitted light images, and photomicrographs are archived in ACORN, The Weissman Preservation Center’s conservation database. Access to this information is available on request by contacting the Weissman Preservation Center or the Curator of Printing and Graphic Arts, Houghton Library. Research for this paper was undertaken while the authors were employed by Harvard University. Harvard University, the Harvard Library, the Weissman Preservation Center, and the Harvard Art Museums played no role in designing the study, collecting, analyzing, and interpreting the data, or writing the manuscript. Catholic Church. Book of Hours and Missal: manuscript, [between 1485 and 1490]. Cambridge: Houghton Library, Harvard University. https://iiif.lib.harvard.edu/manifests/view/drs:49314349$1i, https://iiif.lib.harvard.edu/manifests/view/drs:48280898$1i. Accessed 19 Nov 2017. Forbes Pigment Collection. The Conservation and Art Materials Encyclopedia Online (CAMEO). Museum of Fine Arts, Boston. http://cameo.mfa.org/wiki/Forbes_Pigment_Database. Accessed date 17 May 2018. Elan Technology. Refractive Index and Glass Materials. https://www.elantechnology.com/support/technical-library/refractive-index/. Accessed 15 Nov 2017. Cosentino A. Technical photography of historical pigments. Cultural Heritage Science Open Source. 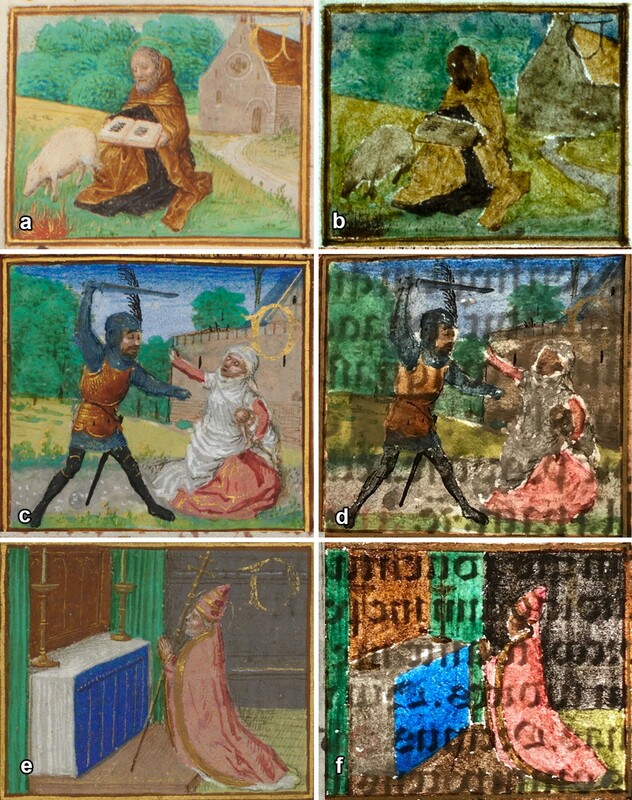 https://chsopensource.org/2013/01/16/multispectral-imaging-of-historical-pigments. Accessed 15 Nov 2017.